Untangling the complicated on-airport roadways at New York-LGA is a significant part of the airport's ongoing transformation, and beginning this week, Delta customers coming to the airport with flights to catch will notice a major new upgrade. A unified upper-level roadway now serves both Delta terminals at LGA thanks to a new vehicle bridge that links the departures-level roads serving Terminals C and D. All departing customers will use the existing ramp on the far east end of the airport that leads to Terminal D departures and then continue on to Terminal C.
"Delta teams are working hard every single day to build our new, state-of-the-art home in Queens, and saving our customers time in getting to and from the airport is something we're proud to be able to deliver," said Ryan Marzullo, Managing Director — Corporate Real Estate. "We're excited about the milestones yet to come as construction continues at a quick pace." Last month saw the opening of a flyover ramp that also benefits Delta customers arriving to Terminals C and D by car. By project's end, the roadways at LGA are expected to be significantly simplified, with the number of traffic signals reduced from 19 to three. 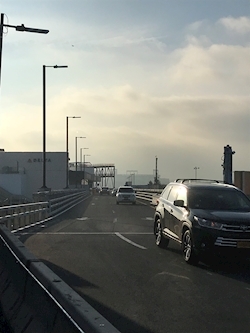 The latest roadway improvements also allow Delta to capture more of the real estate necessary to continue building the airline's $3.9 billion Sky Way at LGA. Customers flying through LaGuardia can already see the glass and metal façade wrapping much of Delta's first concourse on the new facility, and inside the new space, mechanical and electrical elements are progressing quickly.